The aim of this workshop is to spark collaboration between roboticists and developmental psychologists in order to address the origins of the sensorimotor maps that underlie own body representations in both infants and robots. The development of infants’ body knowledge is a primary object of discovery starting before birth. This construction ultimately enables the infant to efficiently interact with the environment. 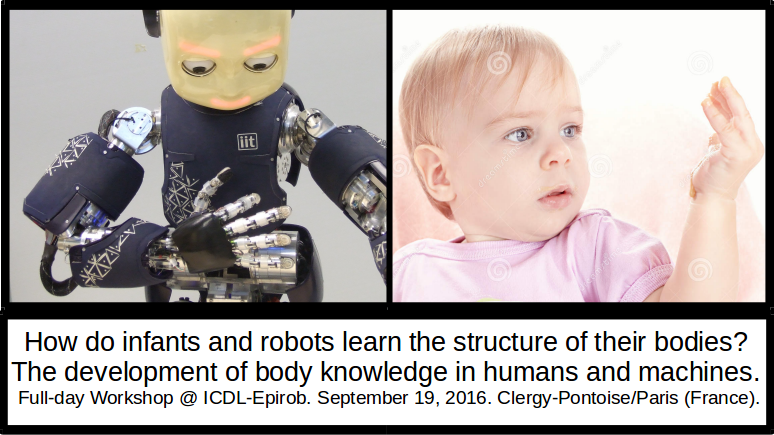 The specific goal of the organizers is to explore the possibility of developing robotic models inspired by the development of human infant body representations. Presentations will consider body knowledge acquisition from sensorimotor, neural and computational perspectives. After the presentations, the discussion will aim at establishing an integrative framework for understanding a) the development of body knowledge in infants, b) the mechanisms that underlie body knowledge acquisition and c) how robots can be used to replicate developmental patterns and progressions that have been found in human infants. On the one hand such robots can become new modeling tools for empirical sciences – expanding the domain of computational modeling by anchoring it to the physical environment and a physical body. On the other hand, robot controllers endowed with multimodal whole-body awareness typical of humans should increase robots’ autonomy.